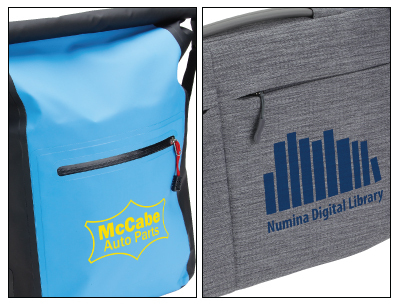 We offer a variety of opportunities to imprint your creative design on all of our products, either through spot color or 4-color process applications. 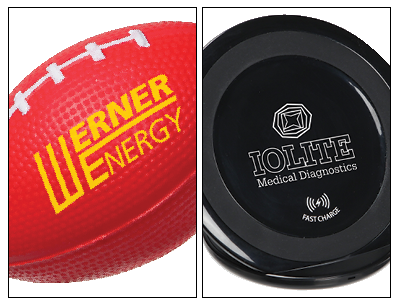 Our most popular process of using an etched plate and silicone pad to crisply imprint your design (up to 6 colors) on our Stress Relievers, Aqua PearlsTM, Technology, Health and Office collections. Production Time: 3-5 business days after proof approval. Setup Charge: $55.00 (G) per color, per design. Re-Setup Charge: $25.00 (G) per color, per design. Artwork is archived for two years. Additional Run Charge: $0.25 (G) per color, per location, per piece. Gel Product Pad Print Run Charge: $0.50 (G) per color, per location after the first imprint, per piece. Our process of infusing an ink through a mesh screen to imprint your design on our collections of Bags, Drinkware and Home products. Production time: 5 business days following art approval. Additional Run Charge: $0.40 (G) per color, per location, per piece. 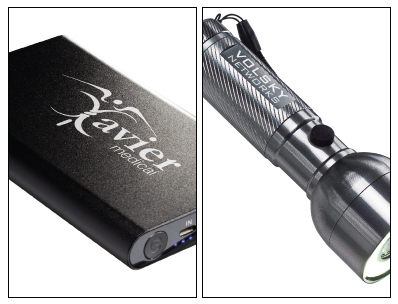 Our process of using powerful lasers to etch your design directly into many of our metal products such as Flashlights, Auto Accessories and Novelty items. Production Time: 7 business days after proof approval and credit release. Setup: $55.00 (G) per design. Re-Setup Charge: $25.00 (G) per design. Run Charge on Drinkware: $1.50 (G) per design (standard front imprint only). Run Charge on Drinkware Caps: $0.40 (G) per design. 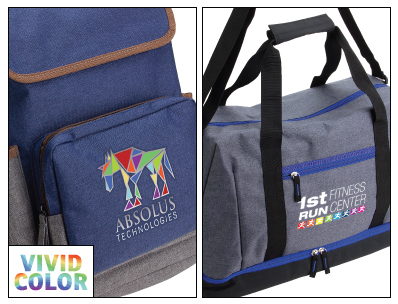 (part of the Vivid Color family of full-color imprinting processes) Our process of providing photo quality reproduction of your design using a paper transfer process and heat that provides excellent color registration on our collection of Bags and Phone Accessories. Setup: $55.00 (G) per design. Setup is free for orders over 250 pieces for transfers on bags. Re-Setup Charge: $25.00 (G) order. Application Charge: $0.60 (G) per transfer, per location. $1.00 (G) per transfer, per location on bag orders. Designs in spot color format or those requiring PMS matches may incur an additional charge. Contact us for details. 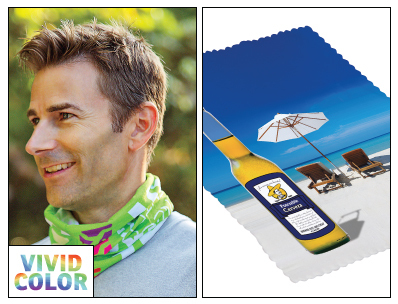 (part of the Vivid Color family of full-color imprinting processes) Our process of using CMYK pigment films and heat-to-transfer colorful dyes to imprint your photo quality design onto our woven fabric products such as Microfiber Cloths and USA-Imprinted Huggles. Re-Setup Charge: $25.00 (G) per order. 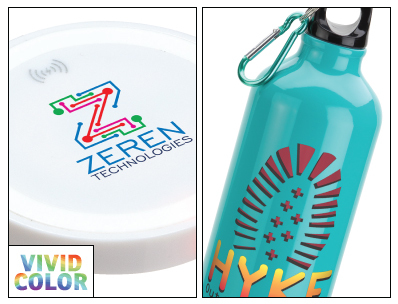 (part of the Vivid Color family of full-color imprinting processes) Our use of a direct-to-product digital process that reproduces your full-color design on many of our Drinkware, Technology and Health products. Setup: $55.00 (G) per design, per location. Run Charge: $0.45 (G) per location, per piece. For drinkware, add $1.00 (G) per location; $1.50 (G) for a full wrap imprint.